Are you nervous about pulling the trigger on a possible new paint job? It’s only normal to have a bit of decision paralysis on such a seemingly big decision. What colors do you choose? What happens if you change your mind once it actually dries on the wall? What happens if–gasp–you don’t like it? We consulted several of our favorite designers to ask them what exactly you can do to prevent any paint-related disasters from occurring in the first place. Read on for their helpful tips. 2. Which Comes First–the Furniture or the Paint Color? “If you are designing a whole room and a paint color is part of the mix, choose the color after you’ve selected some of the bigger furnishings. This will ensure a cohesive look, and will give you the ability to pair the paint with predetermined details like the color or pattern of the fabric on your sofa,” explains Edyta Czajkowska of Edyta & Co. The bottom line? 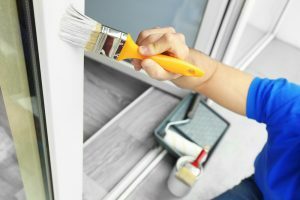 Paint color is a lot easier to change than purchasing new pieces of furniture, so if you’re considering a complete overhaul, the paint can wait.